Everyone has different needs when modifying a home or building for better accessibility. In some cases, a mobility device, such as a stairlift, must meet a specific physical need, aside from assistance with getting up and down stairs. In others, stairlifts are built to handle less-typical structural conditions of your home. While these mobility devices have a similar set of features, including foldable designs, swivel seats, and emergency switches, not all stairlifts are the same. On a basic level, a stairlift is a lifting device using a rail and chair to move a person from one floor to another. The stairlift is installed directly on top of the stairs or to the wall behind and operates with direct or battery power. A straight or curved design is used, and the former is more economical. Some staircases call for a curved stairlift, however, and a custom fixture needs to be added to increase your mobility. Although operating similarly to straight models, curved stairlifts have a rail that matches the shape and angles of the staircase. Price-wise, a curved stairlift is three or four times more than a standard design, as significantly more labor is needed. First, measurements and photographs of your staircase and taken, and this information is then given to our factory. The custom stairlift is produced in four to eight weeks, and installation tales about eight hours. 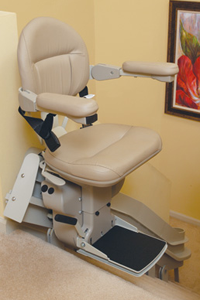 Beyond these two models, many stairlifts are designed for physical or structural needs. As you can see from the selection at Indy Stair Lifts, compact, extra large, outdoor, and wheelchair lifts are available. Out of all stairlifts, which type is ideal for your home? Narrow staircases are often found in older homes, and a compact stairlift may be the model you need. Once installed, a compact, or narrow, stairlift is less than a foot from the wall, and the seat, armrests, and footrest fold up at either end. If you expect individuals of varying sizes to use the stairlift, a larger model may be needed, and an extra large stairlift accommodates all body types and sizes up to 500 pounds. Commercial facilities, just to be safe and accommodating, should consider installing such an extra-large stairlift. Not all stairlifts are used indoors, and a home or building with outside stairs or a porch may need such a device. With all standard features, an outdoor stairlift is designed with weather-tight covers and is durable enough to withstand all types of weather. Platform, or wheelchair, stairlifts may be used outdoors, as well. Installed inside or outdoors, such a stairlift has a platform large enough to support and move a wheelchair or motorized scooter up to 40 feet.